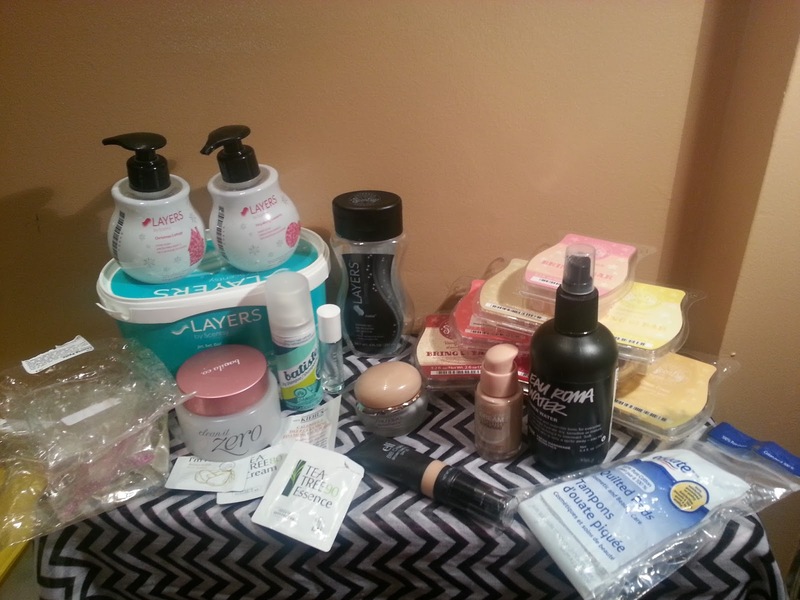 Deidre's Discoveries: December & January Empties! I know that it's a little weird that instead of doing an empties post every month, I collect items over two months and then do my post. For some reason I feel like at the end of one month, I have like 4 items, which seems kind of pointless to do a whole thing about. But then at the end of month two, I have a huge collection growing. At the end of the day, I guess all that matters is that I'm using up some items! I do find most of my empties are usually skin care related. I don't know what it is, but makeup takes me forever to get through. Yet, I'm always buying more! Yay! Look at all the things! :) Let's just get right into it! First up, all the Scentsy stuff. I made it my mission to use up some older bars that had only 2 or 3 cubes left. Others that were old. Or ones that I just wasn't a huge fan of. The bars that I used up were: Berry Blush, Lemons & Berries, Rio Beach, Blueberry Cheesecake, Cherry Vanilla, Watermelon Patch, Bananarama and Camu Camu. Some of them are still available, some were back as bring back my bar scents, and some are just old and no longer available. I also used up two Layers by Scentsy hand soaps. These were purchased during a huge sale in July. Since they were Christmas scents (Very Merry Cranberry and Christmas Cottage) I tried to hold off using them until the holidays. 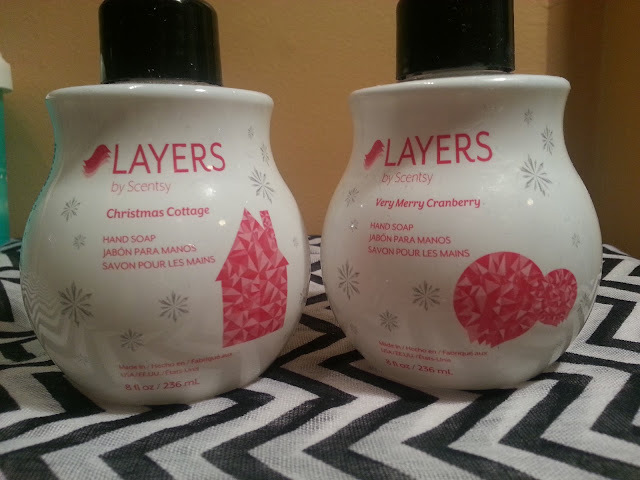 Both smelled amazing, and I wish they didn't discontinue the Layers line. Although there are some other scents that are still available in the closeout/sale section of the site. I absolutely love this scent. I have it in the car, I have it as shower gel, I have it as a bar, I have it as a scent pak in my closet. It's amazing. A little floral, but light. I'm not usually a huge fan of floral scents but this changed my life! Haha. 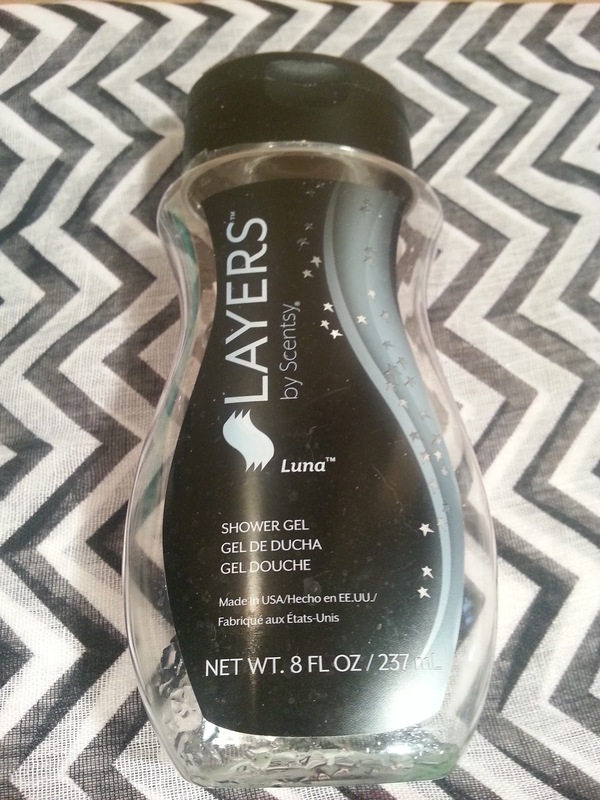 I think I've posted about their shower gels before. They're a little smaller than other brands, but the scents are great. They last a long time since a little gel goes a long way. I purchased quite a few of these in August when they were discontinuing them, so expect to see other scents in the next few months. 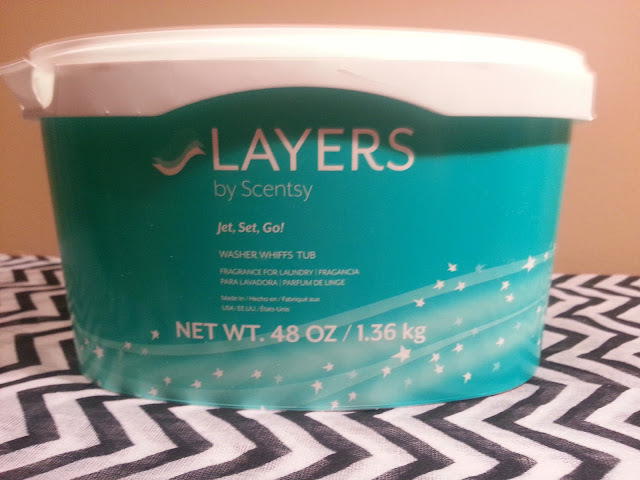 Layers by Scentsy - Washer Whiffs in Jet, Set, Go! I love the washer whiffs made my Scentsy. They make my clothes smell so good. I used some host rewards to purchase these. Jet, Set, Go! is described as "Jet off to a balmy tropical paradise of Brazilian orange, jungle papaya, and island vanilla." They definitely have a clean scent, with the tropical undertones. I really enjoyed this scent but I found that it didn't last long on our clothes. My all time favourite clothing scent is Black Raspberry Vanilla, and they tend to last much much longer on the clothing. This is the larger size bottle between the two that Lush offers. 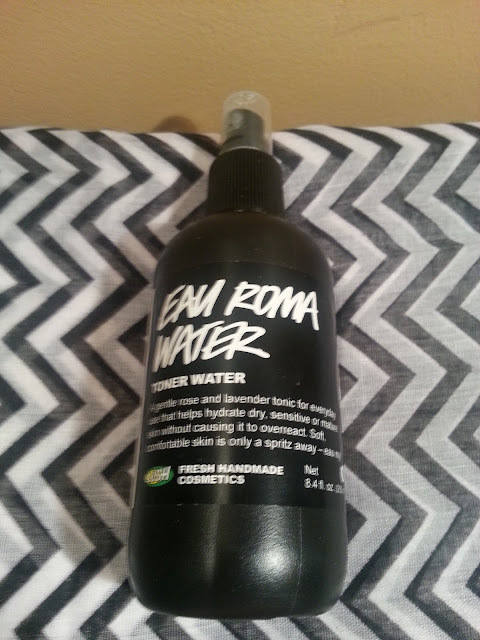 I absolutely love this toner water. I use it as a toner, I use it as a makeup setting spray, I use it if my skin feels dry and needs an instant moisture boost. It's a rose water, so it smells great too! I've already repurchased this! I got this from ChickAdvisor awhile ago, but I really liked it. For the past year or so, I pretty much just throw my hair up into a pony tail once it's air dried (unless I need to style it for some reason) so I didn't use this as quickly as I thought I would. It smelled great, it didn't leave an awful white cast in my hair. I'd consider purchasing it if I needed a dry shampoo. I use this on break outs as tea tree is supposed to be good for helping them move along. I've had this for awhile, longer than I'd like to admit, but I always pulled it out when I had a break out. I ended up purchasing a Tea Tree Toner from Lush to use in place of this. 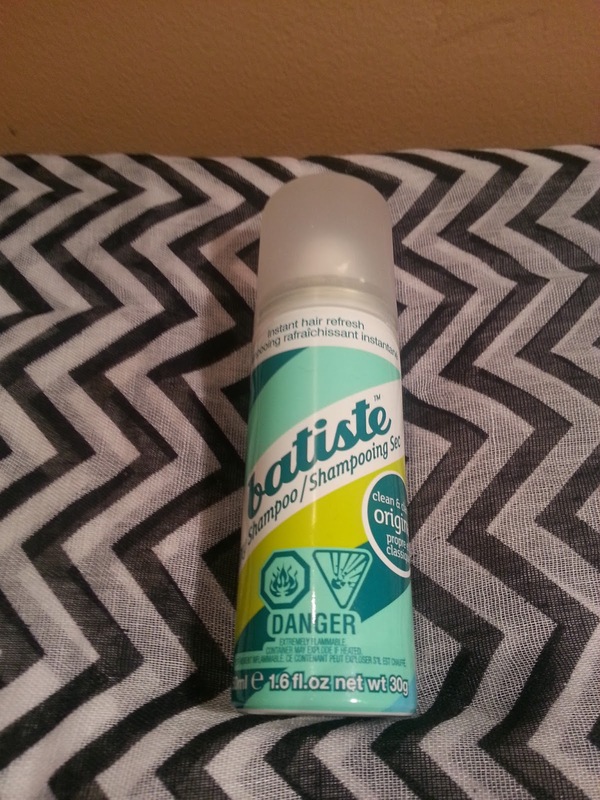 I would repurchase this in the future if other methods don't help. I did a full review here in July. I loved this stuff! I love that it's more of a balm, so you can take it to go anywhere, and you won't have to worry about it leaking everywhere like you would with the liquid oil cleanser. A little goes a long long way, and it removed ALL of my makeup. This was the original scented version, and I didn't find that it irritated my skin at all. I have already repurchased another, but in the purity (unscented) version, to compare it to the original. Love it! 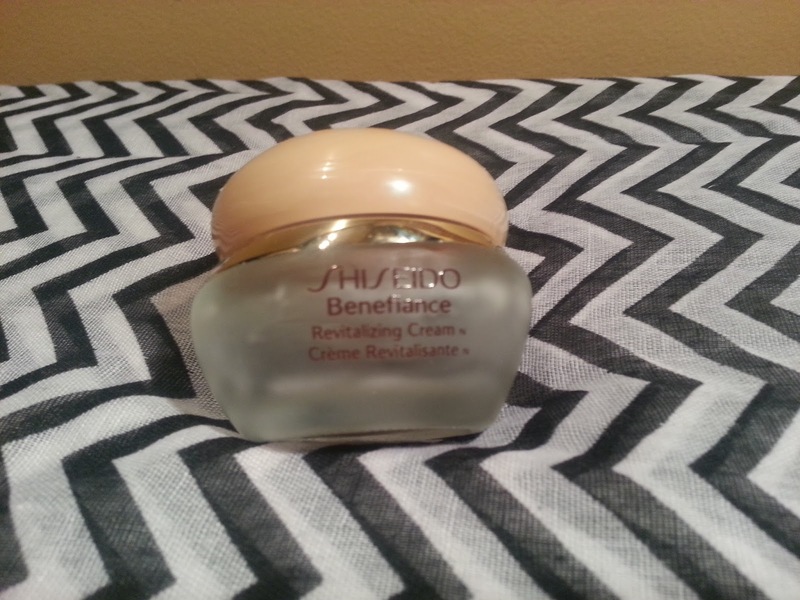 This is my holy grail moisturizer. I really didn't ever want to use the rest up, but it was getting pretty old. I'm still so angry with Shiseido that this was discontinued. I ended up finding another Shiseido moisturizer that is pretty comparable, but also $40 dollars more than this was worth. Ugh. I still need to do a review on it. Anyway, this old stuff I love. I'm sad it's done. I would repurchase over and over again if it was still available! TonyMoly I'm Real Avocado Rich Cream - This was a rich cream. I loved the consistency. It was white (not green like an avocado - ha!) I liked it for what I got inside.. It was about 2 uses. Kiehl's Calendula Deep Cleansing Foaming Face Wash - I got about 3 of 4 face washes out of this, it was a generous sample. It's more for normal to oily skin types, so it did dry my skin out a little. I wouldn't purchase this just because of that reason. 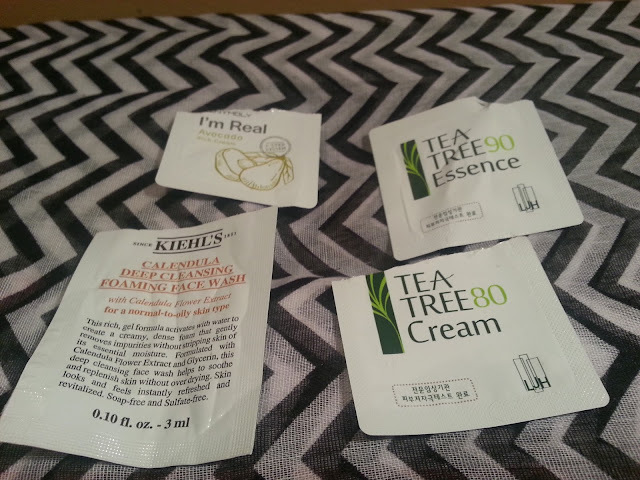 Tea Tree 90 Essence and Tea Tree 80 Cream - The essence was super watery, and bother smelled like tea tree. I used this in hopes to clear up some acne issues I was having. There wasn't enough inside either to make a huge difference on my skin, but I think it may have helped in some targeted areas. 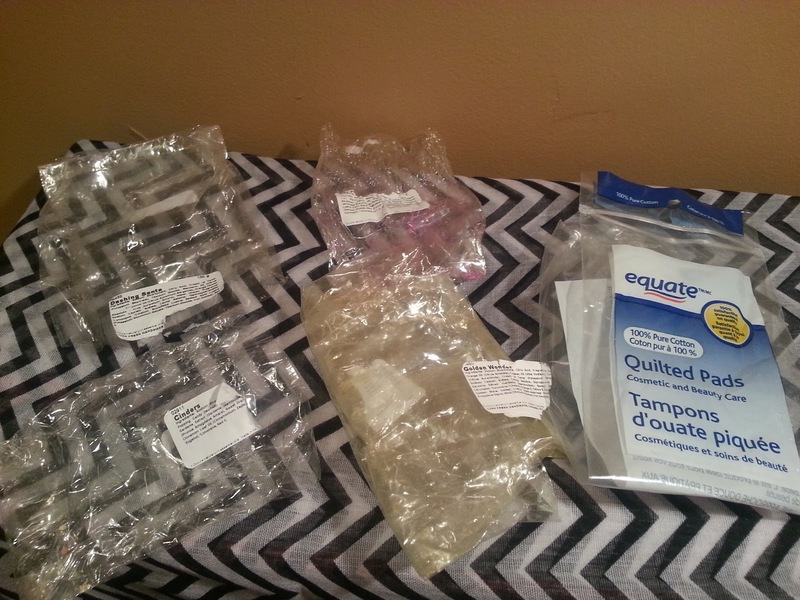 This just looks like a bunch of garbage lol but the packaging is from some Lush products and those round cotton pads. Lush - Cinders bath bomb, Dashing Santa bath bomb, Bar Humbug bubble bar and Golden Wonder bath bomb. I won't go into too much detail here as I have individual posts planned... but I love Lush! I can't believe it took me so long to try them! Equate - Quilted Pads - These are just those round cotton pads. I like them for removing nail polish, removing makeup, applying toner. They're very versatile. I've already repurchased! I forgot these in the huge picture, so I figured I'd just put them all in one picture alone. Innisfree - It's Real Squeeze Mask - in Strawberry, Rice, Aloe and 2x Rose. I got a pretty good deal on these, so I picked up quite a few. I have to say that I'm not a huge fan of these because I find they have way too much essence in them. I squeeze some essence off the masks as I'm taking them out of the package, and they still drip everywhere. I can wear them for 30 minutes and they're pretty wet still when I take them off. 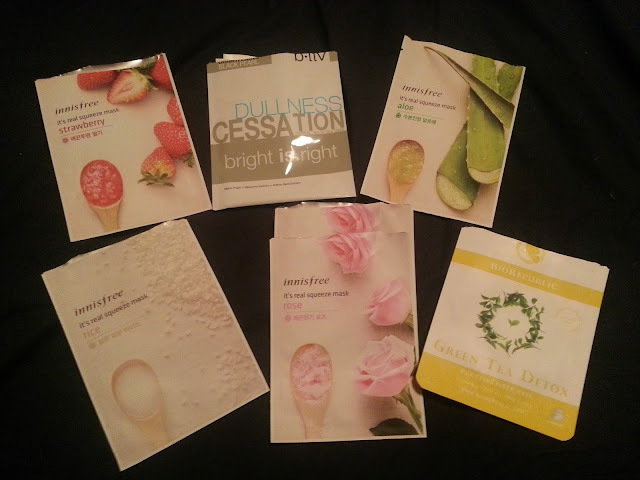 Their website says the Strawberry is brightening , Rice is moisturizing, Aloe is nutri-moisturizing, and Rose is firming. I didn't find very much difference in my skin besides the moisturizing ones. But I still prefer TheFaceShop's rice mask over the Innisfree mask. I received a bunch of these for review, so that post will be coming up shortly. I liked this one, I did notice some of the redness on my face faded a little after using this. I still have a lot to go through so I don't need to purchase any time soon! 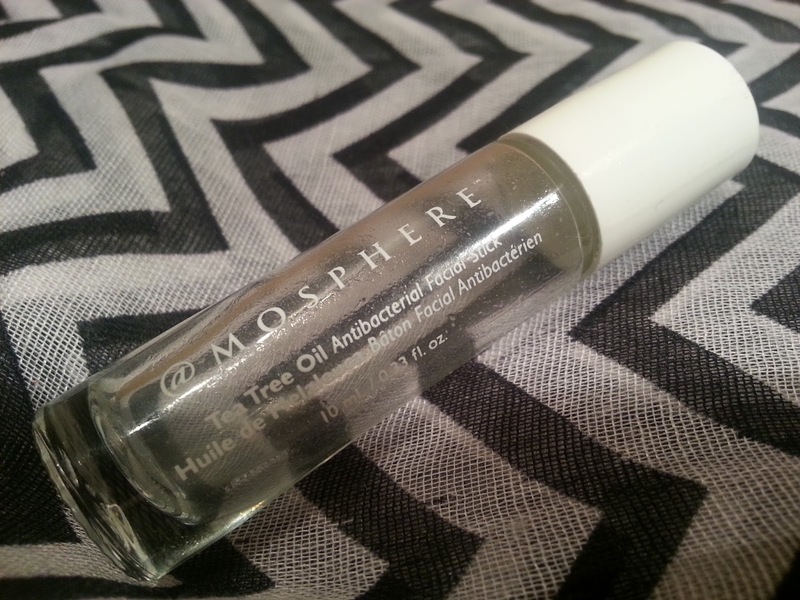 I got this in a Birchbox, and I did like it. They are pretty expensive though so I wouldn't repurchase. These aren't exactly empty, but they needed to be tossed. Maybelline Dream Liquid Mousse Foundation in Porcelain Ivory - there is no way this is porcelain or ivory. I thought maybe I could just make it work by diluting it with lotion when I applied it, but it didn't work. It also oxidized SO bad. Oompa loompa style. I'm not a fan. It started to get really thick, and I've probably had it for 2 years now. So time to go. 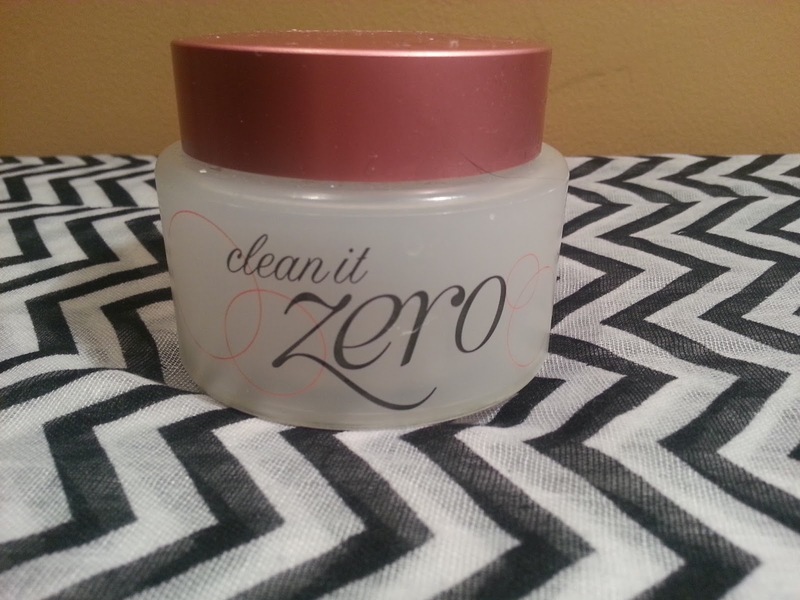 I wouldn't repurchase this formula, but I love the mousse that comes in the compact. That colour seems to match better (although they're supposed to be the same) and it's more moisturizing. 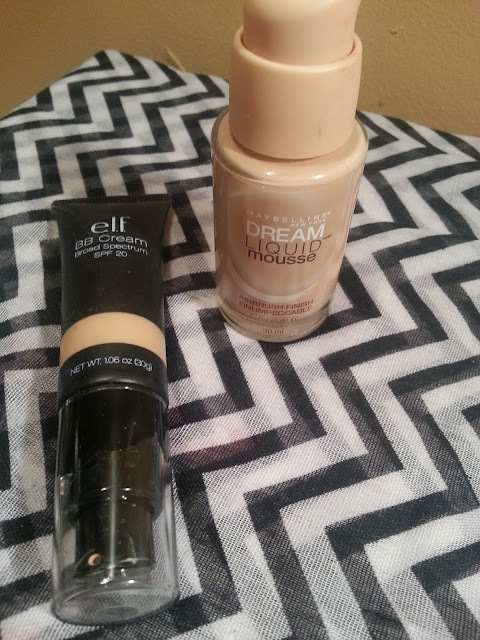 E.L.F - BB Cream with SPF 20 in Fair - this shade seemed to work for me, but there wasn't very good coverage. I know with BB cream you don't expect something with full coverage, but this literally covered nothing. I didn't like it too much and it just sat in my makeup case, it started to leak oil, and it also had to go. I wouldn't repurchase it. If you're interested in seeing what other Canadian Beauty Bloggers used up for January, check the link-ups below!